Portland hotel offers stay in President’s Suite, with private balcony views of the city’s Independence Day fireworks display. America’s most important national holiday is just around the corner, a time to celebrate our country’s independence and the many freedoms we enjoy. The Portland Marriott Downtown Waterfront wants to celebrate as well by offering a unique package that will have guests excited to live in a country where everyone is “created equal” and has the “unalienable right” to party like a president. The Red, White & Blues Package features accommodations in the Portland hotel’s 940 square foot Presidential suite located on the 16th floor. Featuring a large balcony, the room offers guests one of the best views in the city for viewing the July 4 Fireworks display, as well as overlooking the Waterfront Blues Festival taking place in the Tom McCall Waterfront Park adjacent to the hotel. In addition to the private balcony, the Presidential Suite features two connecting bedrooms with a king bed in each, three bathrooms, and a built-in wet bar and pantry area. The deal also includes an expansive, buffet style-breakfast (fit for a king, perhaps) for up to eight people, served each morning in the suite. All-in-all, this Portland, Oregon hotel deal makes it difficult not to feel just a little bit above the crowd, in more ways than one, in a suite fit for a president, with an amazing vantage point from which to survey all the festivities below. This special Portland hotel deal is available Wednesday the 3rd and Thursday the 4th of July, 2013, requiring a 2 night stay; maximum occupancy is eight persons. Tickets to the Waterfront Blues Festival, as well as after-hour festival events taking place in the hotel, are not included in the package offer. 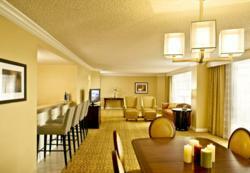 A limited number of suites are available, so make reservations soon. Be sure that promotional code CUE appears in the Corporate/Promotional code box when making your online reservation, or call 1-800-228-9290 in the US and ask for promotional code CUE. Welcome to a Portland hotel offering all the urban chic and Northwest flavor of Oregon’s most vibrant city. The Portland Marriott Downtown Waterfront Hotel is centrally located on the Willamette riverfront, near Portland State University and many other top downtown attractions. Guests at this Portland waterfront hotel will enjoy rooms featuring luxurious Ritz Carlton bedding, wireless Internet access, LCD TVs, and modern bath amenities. Active guests can stay fit with an indoor pool, whirlpool, and 24-hour fitness center. The Portland hotel’s waterfront restaurant, Truss, serves fantastic cuisine with an artisanal flair, with an inviting neighborhood hotspot lounge popular for a local brew, wine, or hand-crafted cocktail. For event planners, the hotel boasts 25 meeting rooms, and 40,000 sq. ft. of event space, including an Exhibit Hall with over 15,550 sq. ft. The hotel is ENERGY STAR compliant and Green Seal Silver Certified, making them one of the only hotels in Portland to have both ratings. Visit http://www.marriott.com/PDXOR for more information.